The term head and neck cancer is used to summarize a group of tumors derived from cells in one of the following subsites of the upper aerodigestive tract: the oral cavity (mouth), oropharynx, nasal cavity, nasopharynx, hypopharynx, salivary glands and the larynx (figure 1.2). Except for salivary gland carcinomas, all tumors are squamous cell carcinomas. 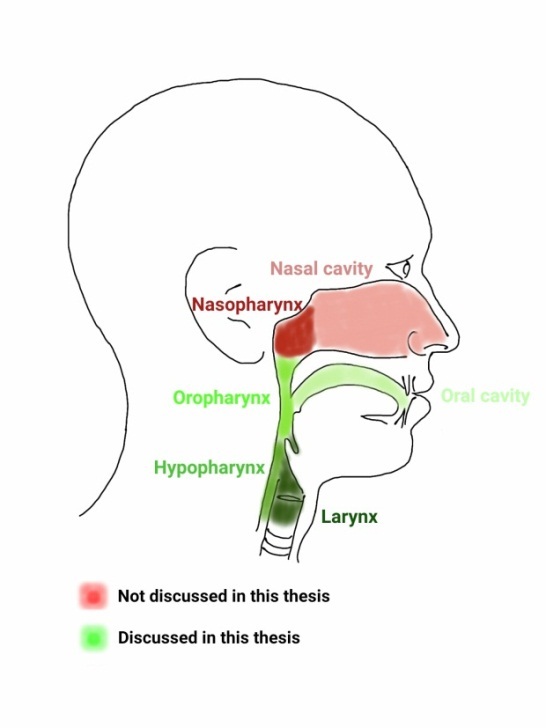 In the remainder of this thesis, the nasal cavity, nasopharynx and salivary glands will not be included when head and neck cancer is mentioned. Figure 1.2: Head and neck cancer regions. Head and neck cancer is the 7th most common cancer worldwide (figure 1.3). Yearly over 600,000 people are diagnosed with head and neck cancer and over 350,000 people die from it (4). The incidence is generally higher in developing countries (4). From the different subsites of head and neck cancer, cancer of the lip and oral cavity is the most common (44%), followed by cancer of the hypo-/oropharynx and larynx (figure 1.3). The highest incidence of head and neck cancer is in the age group between 55 and 70 years old (5). Head and neck cancers occur predominantly in men, with only 20-30% of all new patients in the US in 2017 expected to be female (calculated from table 1 in ref.(6)). Figure 1.3: Incidence of all 14,067,894 cancer cases worldwide in 2012. Data plotted from GLOBOCAN 2012 data (website) (7). An estimated 75% of all head and neck cancers can be attributed to tobacco smoking and excessive alcohol consumption (8). Heavy smokers or drinkers have a higher risk to develop head and neck cancer, with respective odds ratios of 5 and 2 (9). For people that abuse both alcohol and tobacco, the odds ratio is almost 40, showing that the effect of both substances together is more than additive (8). Another important causative agent is infection with the human papilloma virus (HPV), especially subtype HPV16 (10). 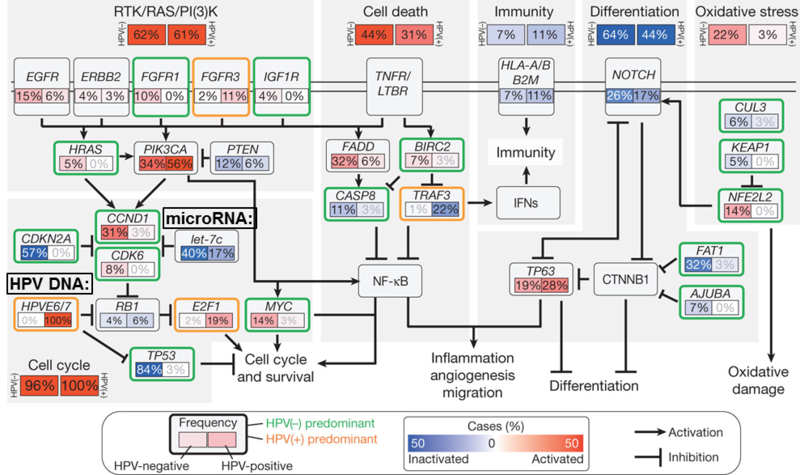 The virus produces oncoproteins E6 and E7, leading to tumor initiation. For all tumors the HPV prevalence rate is 26%, this is lower for cancer of the larynx and higher in oropharynx tumors (10). Although HPV infection is very common and in most cases does not lead to the development of cancer, the risk to develop an oropharyngeal tumor increases substantially with HPV16 infection. When comparing patients with oropharyngeal tumors to a group of healthy controls, the HPV16 infection rate is 30-35% versus 0.5-1% in control groups (11, 12). This difference in HPV infection rates can be measured already ten years before the diagnosis of the oropharyngeal tumor (12). There are many ways to study all characteristics of a head and neck tumor: from a simple look in the mouth to an array investigating all biological processes in a tumor (summarized in figure 1.4). Figure 1.4: Methods to study a head and neck tumor. Clinical examination is used to get an initial impression of the extent of the disease. For head and neck cancer this comprises mainly endoscopic examination of the tumor (youtube) and palpation of the tumor and regional lymph node stations in the neck. Ultrasound can be used in combination with a fine needle aspiration biopsy to assess tumor presence in cervical lymph nodes or assess depth of infiltration in oral cancer. Computed tomography (CT) scanning is often used to get an overview of the location of the tumor and possible cervical lymph nodes. It is routinely used to make segmentations to determine the extent of the radiation fields or measure tumor volumes. Magnetic resonance imaging (MRI) scanning is often used to get a better soft-tissue contrast and can be very helpful to visualize and delineate head and neck tumors. Additionally, different scanning protocols can be used to image different structures more clearly or study different tissue characteristics like diffusion or perfusion. Another method to produce functional images is positron emission tomography (PET): different molecules labeled with a positron-emitter, like fluorine-18 can be used. After injection into the body, the molecule of choice will distribute throughout the body. The best known PET tracer is fludeoxyglucose (FDG), glucose labeled with fluorine-18, used to study glucose uptake in different tissues, which can be used to detect (metabolically active) tumor cells. A clear advantage of PET scanning is the accrual of real-time biological information and the possibility to use a variety of molecules as PET tracer, depending on the process one means to study (15). Examples of tracers other than FDG, that are of particular interest in radiation oncology are thymidine labeled with carbon-11 to measure proliferation, FMISO ([18F]Fluoromisonidazole) and Cu-ATSM for hypoxia imaging and 99mTc-Labeled annexin to study apoptosis (16). Apart from anatomical information, recently, different features acquired with these different imaging modalities have been shown to be useful as predictors of outcome (radiomics) (17, 18, 19, 20, 21). The obvious advantage of radiomics is that multiple features can be extracted from standard CT, PET or MRI scans that are already part of the diagnostic or treatment process. The challenge is to correctly place relevant radiomics features in a biological context (21). To obtain real-time information about a tumor, a probe can be used to make measurements inside a tumor. The best known are the Eppendorf pO2 measurements with an oxygen sensitive needle probe inserted into the tumor (22). Although this is an invasive technique, it does give access to real time measurements with the possibility to repeat measurements during treatment. When (part of) a tumor is taken out, the tissue can be studied in a variety of ways. The presence of the HPV virus can be determined on the biopsy material, tumor cells can be grown outside a patient, slices of tissue can be stained and viewed under a microscope and cells or pieces of tissue can be used to study the proteins, RNA or DNA of a tumor or even a single tumor cell (23). Slices of tumor can be fixed onto glass to study them under a microscope. Different staining protocols, using (fluorescent) dye labeled antibodies, can be used to visualize various markers inside or around tumor cells. This can also be done in a tissue microarray (TMA) format, meaning multiple small slices of tumors from different patients can be stained on the same slide. Cells can be grown in mice (xenografts) or in short- or long term 2D or 3D cultures. This allows researchers to multiply the tumor and to further study the mechanistics of the cells or test the effectiveness of potential therapies. A lecture on ‘the good and bad ways’ to do this by Adrian Begg can be viewed here: Good and bad ways to assess treatment response . How (cancer) cells behave is determined by the genetic information stored on approximately 3 billion DNA bases, called the genome (24). A strand of DNA consists of a double stranded sequence of four bases: cytosine, guanine, adenine and thymine. Parts of the DNA can be stimulated to make copies to ribonucleic acid (RNA), a process called transcription. RNA consists of single strands of the bases guanine, uracil, adenine and cytosine, complementary to the transcribed part of DNA. Only a small part (about 1%) of the total DNA contains sequences with exomes (genes), that can be transcribed to messenger RNA (25). This form of RNA is translated to proteins, that will execute the desired actions in a cell (From DNA to protein in a movie). In total humans have around 20,000 genes (26) and even more proteins because of post-translational modifications (27). The suffix ‘-omics’ stands for a method acquiring a lot of data about all genes in one experiment (Introduction to ‘omics’ by NASA), which is possible on DNA, RNA and protein levels (figure 1.5). The simultaneous study of the whole genome (DNA) from one sample is termed genomics (28, 29, 30) (NASA explains genomics). Using new techniques to study the whole genome, all cancer-related mutations, translocations, amplifications and deletions can be examined and correlated with outcome or treatment response. Functional genomics studies what kind of processes are active in a tumor (cell) (31). Proteomics, the study of all proteins that are present in a tumor (cell), would presumably best represent what is occurring in that cell at a given time point. However, the study of all proteins in one sample is challenging and less sensitive than other approaches (27, 31). These other approaches include epigenetics, the study of manipulation of DNA to express certain genes, and transcriptomics, the study of messenger RNA that is translated to proteins (32, 33, 34) (NASA explains transcriptomics). For many genes there is a good correlation between messenger RNA and protein levels and an even better correlation between groups of messenger RNAs and certain biological processes. Still, messenger RNA does not always translate into protein. One of the reasons for this is the presence of microRNAs: small pieces of single stranded RNA (around 22 nucleotides) that can singlehandedly silence hundreds of genes (35). 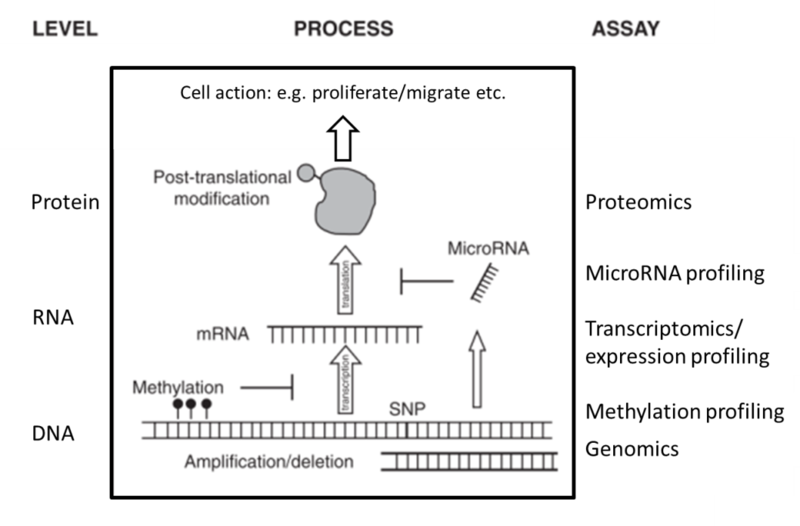 Almost 1,000 microRNAs have been identified so far, regulating at least 60% of all genes (36, 37). MicroRNAs regulate gene expression by binding to their (partly) complementary sequence on messenger RNA molecules, finally resulting in reduced protein production (38). MicroRNAs can reduce messenger RNA levels or directly reduce protein levels by translation inhibition, multiple modes of silencing seem to exist, that can be active at the same time (39, 40). Figure 1.5. ‘Omics’ at different levels. Adapted from chapter 23 (41) by A.C. Begg. A median of 5 mutations per megabase was found in a group of head and neck cancer patients (42). Although no two tumors have the exact same genetic defects, there are some faults that are common amongst different head and neck tumors (43). It has to be stated that tumors caused by HPV do not possess all the same genetic alterations (44 ,45, 46, 47) and might be considered a different entity from tumors that are mainly caused by smoking and drinking (48, 49). Some of the most commonly described genetic alterations in head and neck cancers are in the p53, CDKN2A (p16), CCND1 (cyclin D1), epidermal growth factor receptor (EGFR), PIK3CA and NOTCH pathways (47, 50) as can be seen in figure 1.6. A loss or mutation of TP53 on chromosomal location 17p13 can lead to decreased apoptosis and increased proliferation. This is observed in about 50-80% of head and neck cancers (47, 51, 52). The cyclin-dependent kinase inhibitor 2A (CDKN2A) gene produces p16, which inhibits CDK4 and CDK6 to prevent phosphorylation of the Rb protein, leading to inhibition of cell cycle progression from G1 to S-phase. In 80% of head and neck cancers the p16 protein is absent, mostly by deletion of the gene location of p16 on chromosome 9p21, which leads to increased proliferation. A study by van der Riet et al, showed that p16 was deleted in 70% of head and neck tumors (53). Cyclin D1, on the other hand, activates Rb, thus enabling the transition from G1 to S phase. An activating polymorphism of this gene was described in 25% of tumors (54), whereas the chromosomal region of this gene (11q13) was amplified in 20-50% (43, 55). Another often described oncogene is the epidermal growth factor receptor (EGFR) located on chromosome 7p11, which is a regulator of tumor cell growth, invasion, angiogenesis, and apoptosis. This receptor shows overexpression in 40% of tumors (56). Reasons for overactivation of EGFR signaling can be the expression of mutant EGFRvIII (57) or an amplification of the EGFR gene (58). Not just EGFR, but other genes in the PI3K-AKT or RAS-MAPK can be deregulated, giving the same effect. More recently, inactivation of the NOTCH pathway has been found in head and neck tumors. Inactivation of this pathway could lead to loss of regulation of several processes like self-renewal capacity, cell-cycle exit, and survival (59, 60). Figure 1.6: Common alterations in 279 HNSCC samples and their role in the different ‘hallmarks of cancer’. 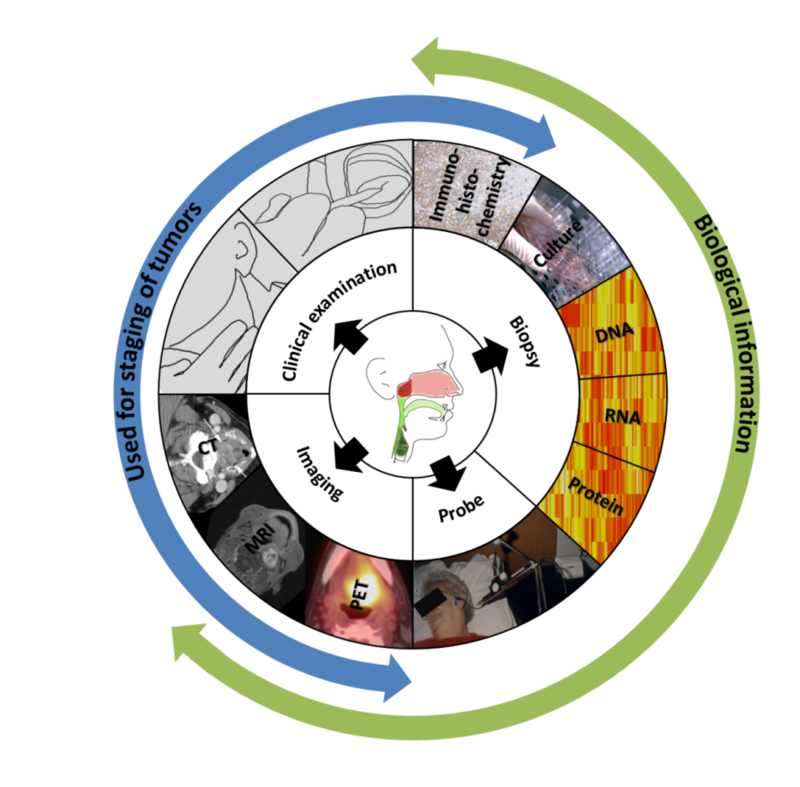 Picture adapted from Lawrence et al. (47) with permission according to Nature Publishing Group guidelines. Based on the spread and extent of the tumor, determined by clinical examination and imaging, patients are classified into different stage groups. Staging can then be used to select the correct treatment or make an estimation of the prognosis. The staging of tumors of the larynx, oropharynx, lip and oral cavity is done using the TNM AJCC Cancer Staging Manual, for this thesis the seventh edition was used, summarized in table 1.1. This edition has recently been updated to the eighth edition (61). 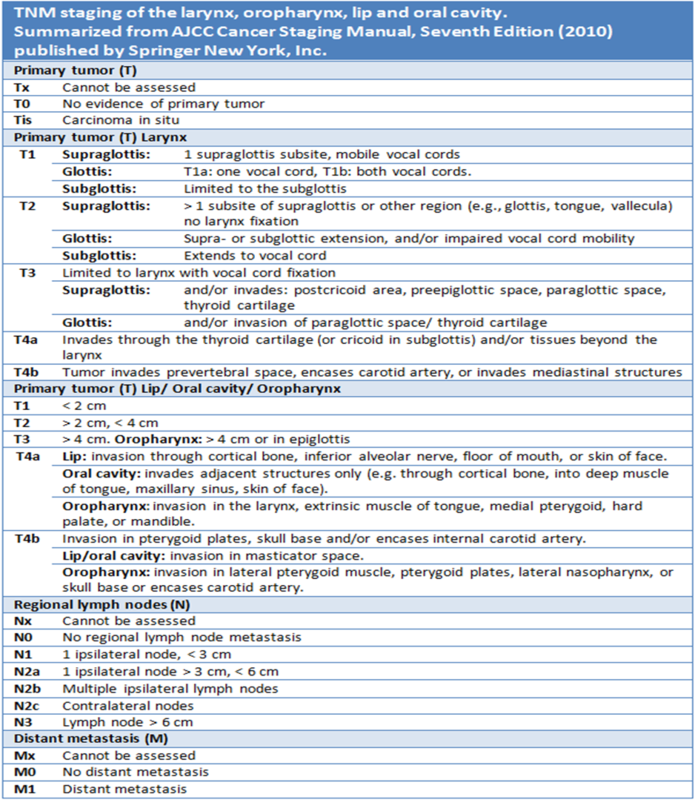 Table 1.1: Staging of head and neck tumors. Summarized from AJCC Cancer Staging Manual, Seventh Edition (2010) published by Springer New York, Inc. According to the specific (sub-)site and the stage, a patient with a head and neck tumor will be treated with one or a combination of these modalities: surgery, radiotherapy, photodynamic therapy, chemotherapy and targeted therapy (62, 63). Usually treatment consists of radiotherapy, chemoradiotherapy or surgery with or without adjuvant (chemo-)radiotherapy. While surgical resection of the tumor can be effective in terms of tumor control, it is challenging to spare some important functions like speech and swallowing in advanced stages. Therefore a lot of research has been conducted into organ-sparing strategies using either single-modality radiotherapy or radiotherapy in combination with chemo- or targeted therapy. Data from small randomized trials suggest that outcome rates between surgery and (chemo-) radiotherapy are similar, with a possible exception for oral cavity and advanced laryngeal cancers (64, 65, 66). Results of phase II/III studies for the subgroup of small (T1-2) tumors are still awaited (67). Meanwhile, comparable survival rates between surgery and radiotherapy groups were reported in a large literature review of oropharyngeal cancers (68). Generally, less toxicity is reported in these studies when surgery is avoided. Currently, approximately two third of all patients is (partly) treated with radiotherapy: 58% of all patients with pharynx/oral cavity tumors and 74% of all patients with larynx tumors (69). The average overall survival for head and neck cancer is around 50% (4), but this can vary greatly between groups of patients with different characteristics. One way to divide patients into different prognosis groups is to use the TNM stage groups (table 1.2). The 5 year survival can range from 83% for stage I patients to 30% for stage IV patients (table 1.2) (5, 70). Table 1.2: Stage groups. Summarized from AJCC Cancer Staging Manual, Seventh Edition (2010) published by Springer New York, Inc. Five year relative survival rates from SEER data. The first sign of failure after therapy is usually a locoregional recurrence (80-90%, calculated from: (71, 72, 73)). The rate of second primary tumors is significantly higher in head and neck cancer patients than for other tumors. Eventually, 36% of these patients will get a second primary tumor (mostly lung cancer). Roughly 10% of all patients will get a second primary head and neck cancer (74), because HPV, smoking and drinking affect the entire area (field cancerization). Both recurrences and second primaries are challenging to (re-) treat, toxicity is high and the five year overall survival only 20% (75). During treatment the acute dose-limiting toxicity is mainly severe (grade 3-5) mucositis, occurring in approximately 30% of radiotherapy patients and in 40-70% of accelerated radiotherapy or chemoradiotherapy patients (76, 77, 78, 79). In a systematic review that summarizes quality of life data from 37 studies among head and neck cancer survivors, toxicity at one year after treatment was reported (80). Persisting issues reported at that time were mostly fatigue, xerostomia (dry mouth) and sticky saliva. Other observed symptoms at 1 year were problems with appearance, speech, swallowing, taste/smell and sexuality. Primary hypothyroidism has also been described as a late complication after treatment of tumors of the head and neck (81).